Our 3rd TOGO Party is Thursday! Our third school-wide TOGO Party will be on Thursday, April 18, during the school day! Students who do not get their TOGO Card taken up between Monday, March 25 - Thursday, April 18, are eligible to attend the party. 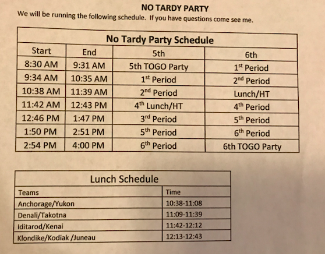 Students who have their TOGO card taken for any reason during this time frame CANNOT attend the party (even if the student earns it back and has his/her card on the day of the party)! Again, if their card is taken anytime from this coming Monday, March 25 - Thursday, April 18, then they CANNOT go to the party!!! We will be on a different schedule on this day, so please see altered lunch times below!